Come the holy of month of Ramadan and one cannot escape the buzz about Mohammad Ali road and the feasting that the area is witness too. 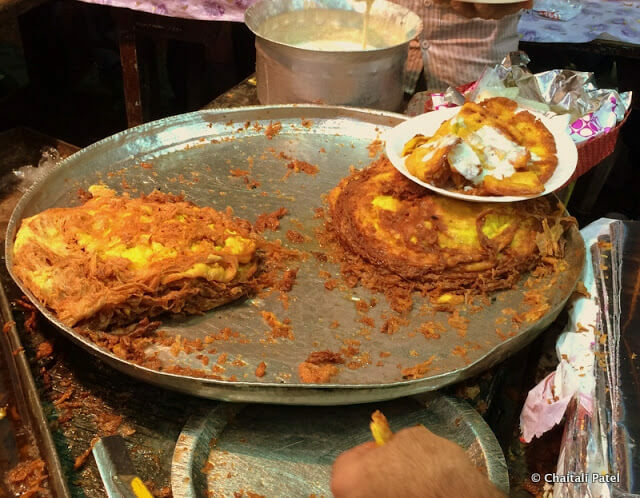 I know people who travel long distances in Mumbai to feast on the specialities served at the many food stalls and eateries lining Mohammad Ali Road and around. 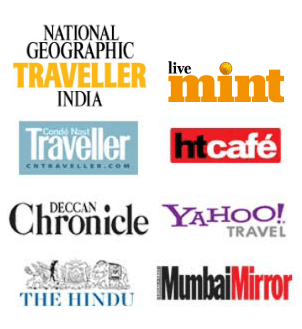 Papers, magazines and blogs catch the fever too, with many listing all the ‘must haves’ and the specialities that one has to try. 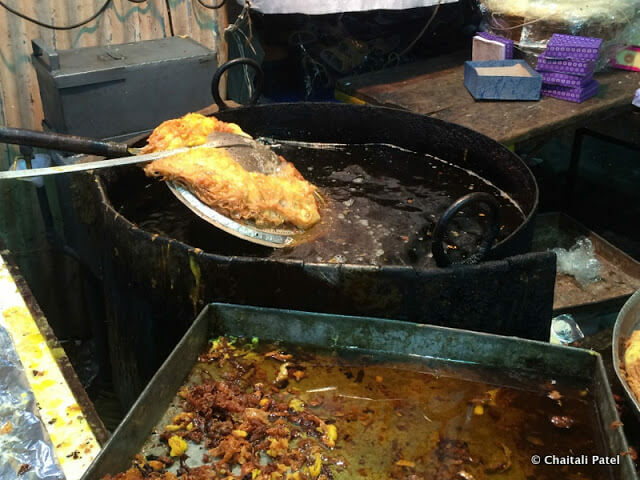 Being a vegetarian, food was not the main draw to trek up to Mohammad Ali road, it was the festive atmosphere, the crowds of people that thronged the narrow streets and the many hidden stories that took me there. Luckily, I found a friend who was as keen as me to go explore the area. Our guide Taykhoom Bohri was a storehouse of information and he took on the task of taking two vegetarian women on a walk down Mohammad Ali road with great gusto. The Prophet’s flight to Medina marks the start of the lunar Islamic calendar and the month of Ramadan is the ninth month of that calendar. It was during the month of Ramadan that Allah revealed the Quran to the last Prophet, Muhammad. Hence the month of Ramadan is considered to be the most holy month of the Islamic calendar. Muslims fast during this period, as it is believed that it teaches them self-restraint, self-discipline and generosity. So during the month of Ramadan, believers have one meal before sunrise called suhoor and then one after sunset called iftar. As the sun begins its downwards descent, the food stalls and restaurants get ready to serve massive crowds that show up on a daily basis. Traditionally, a fast has to be broken with a khajur or date. 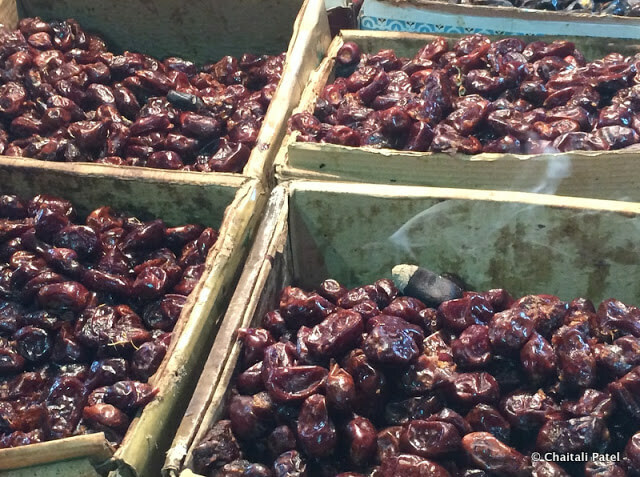 One of the many physical benefits of breaking the fast with dates is that our body benefits from the date’s high level of natural sugars. The date stalls looked desolate by the time we arrived past sunset, as most people had begun their feasting tucking into sweet and savory foods. 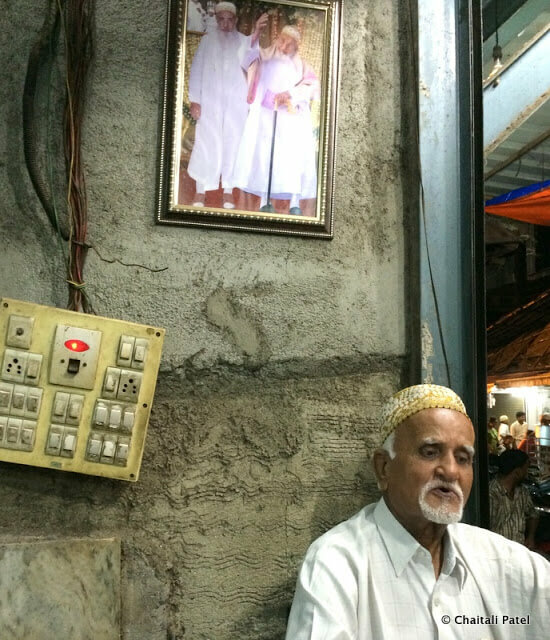 While the food extravaganza stretches from Crawford Market right up to JJ flyover, the lane adjoining Minara Masjid is the heart of all the action. Restaurants put out tables onto the narrow street under awnings meant to protect from the rains that are common at this time of the year. Battling with our noses as they led us in different directions, we jostled with the crowds to savor some of the delicacies we had on our list. First up we started with the mother of all desserts, literally for the amount of sin it packs in – malpuas deep fried served hot with some malai (cream). There are many stalls selling malpuas but the most famous ones are those from Tawakkal Sweets and Suleman Usman Mithaiwala. 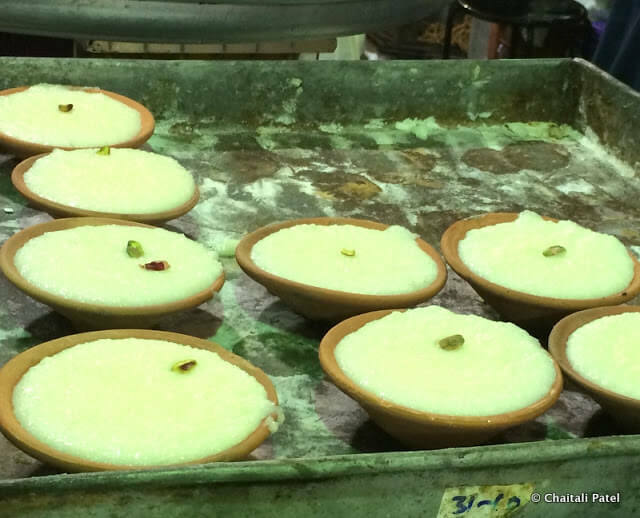 Another favorite at both is their phirni or firni a smooth rice custard that is set in earthen cups. 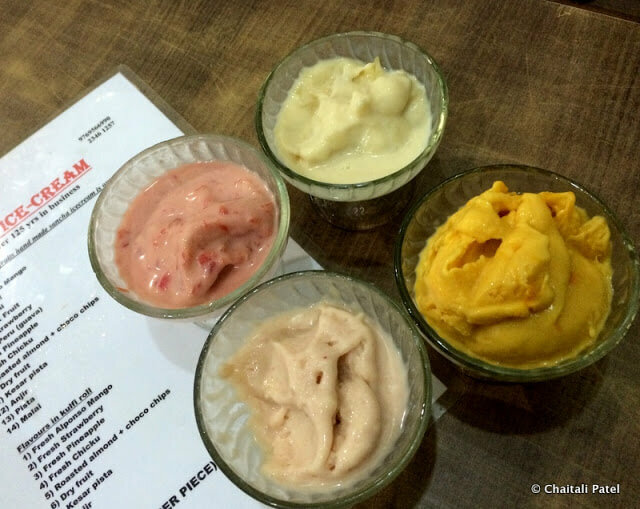 To cater to changing tastes, apart from the original, phirni is available in different flavors such as kesar (saffron), mango and black current. We also tried a very unusual looking dessert called sandal, a fermented rice dish that looked like little puffy clouds. 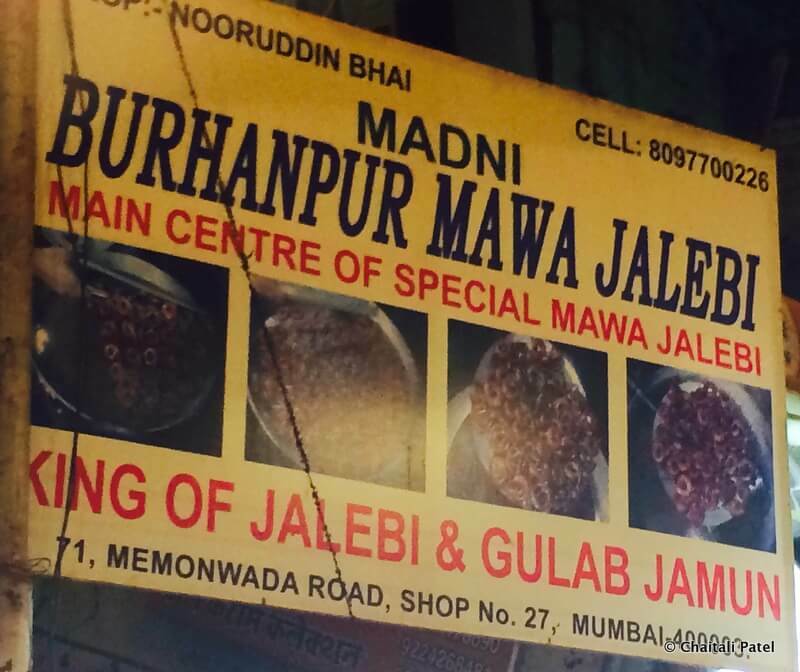 After some searching and asking around we located Burhanpur Jalebi Centre, a small shop that sells dark brown menacing looking but legendary jalebis. 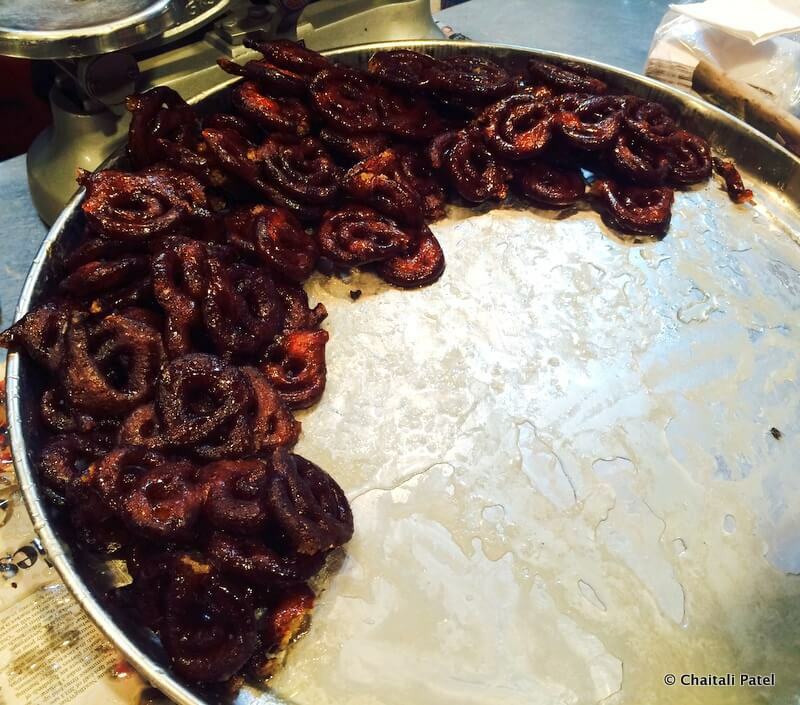 Unlike the usual maida ones, these jalebis are stuffed with mawa (milk solids) and deep fried. We were lucky as just when we found the place, one of the cooks was rolling out a batch of fresh jalebis into hot oil. But the feasting is not all about sweets, the main draw is the succulent meat that is carefully marinated and cooked over several hours so that by the time one eats it, it just melts in your mouth. 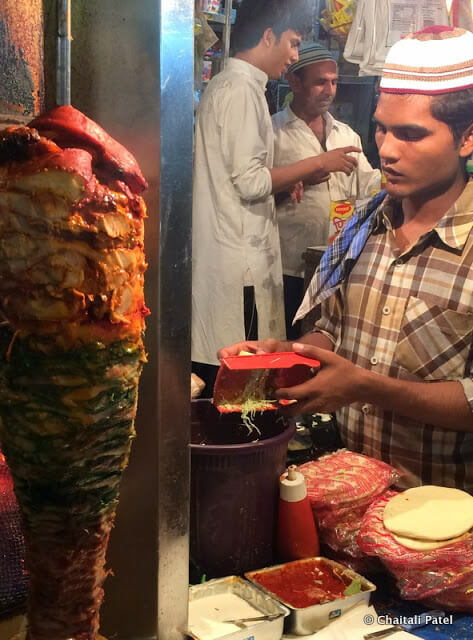 Some of the more popular dishes are the shawarma, seekh kebabs, shami kebabs, chicken hakimi, khichda and nalli nihari. The rows of kebabs hanging on the skewers, the aromas wafting from the charcoal fired tandoors (grills) and the many spices made for a heady combination. For something truly extraordinary try a meal at the Surti 12 Handi in Bohri Mohallah. 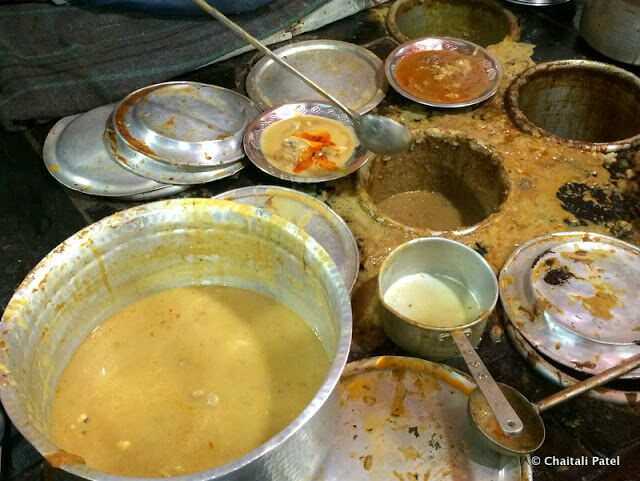 Away from the crowds around Minara Masjid, Surti 12 Handi has been dishing out their speciality – a combination of meats and gravies mixed together from 12 different handis over several decades. The different handis are embedded in a batti (big box shaped oven) and the meats and gravies are covered and slow cooked over a period of 10 to 12 hours. 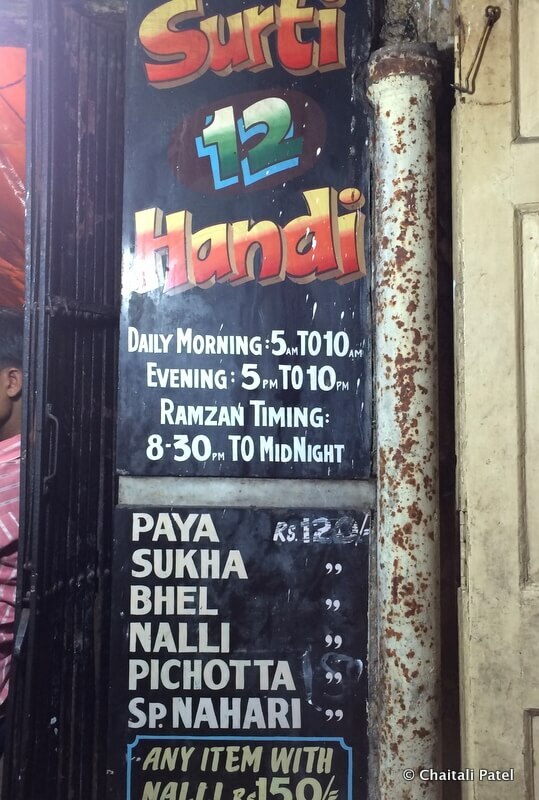 While changing times and tastes have forced them to reduce the number of handis from 12 to 9, they still are known as Surti 12 Handi. 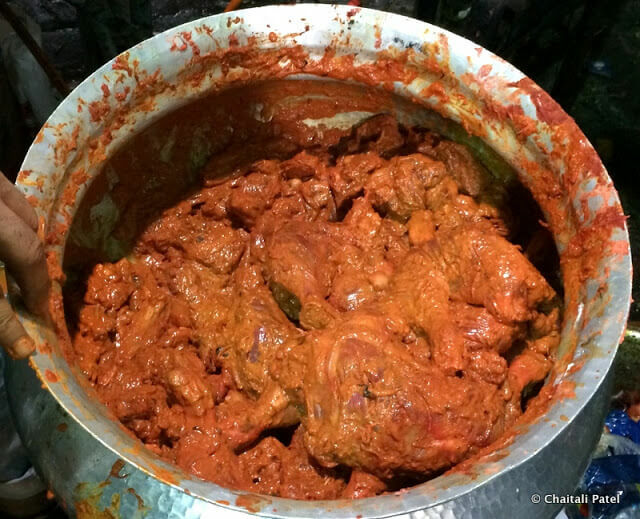 Some of the staples that are still found are pichotta (ox tail), topa (hump), bada paya (trotters of cow and ox), chhota paya (trotters of goat and sheep) and sukha (beef with gravy). 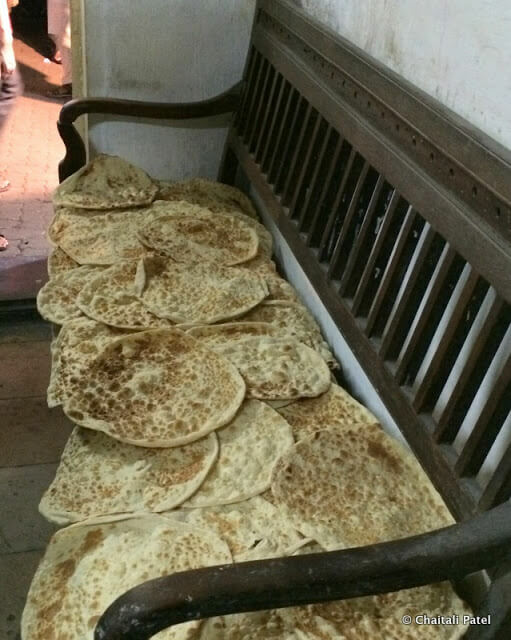 The meats and gravy are served with khamiri roti (made from a combination of wheat and maida) or lamba naan (a triangular shaped flatbread). For the less adventurous apart from the many stalls serving a variety of dishes there are popular restaurants that also have their own specialities. 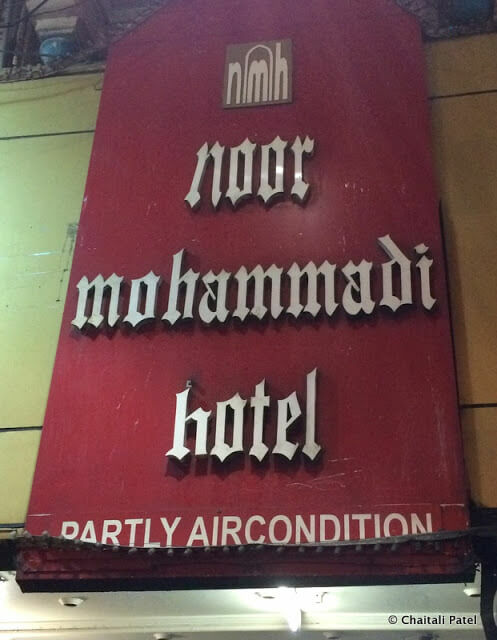 The most notable being Noor Mohammadi Hotel. Popular with locals, this restaurant boats of a famous clientele from Bollywood stars, musicians and artists. Possibly India’s most famous artist – M. F. Hussain ate at this restaurant and was so pleased with the food that he made a sketch right on the spot and presented it to the owner. 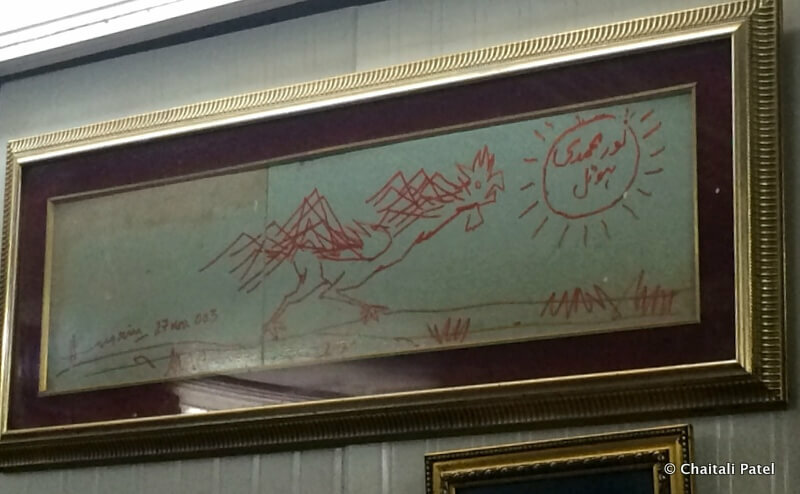 The sketch is proudly displayed in the restaurant even today. 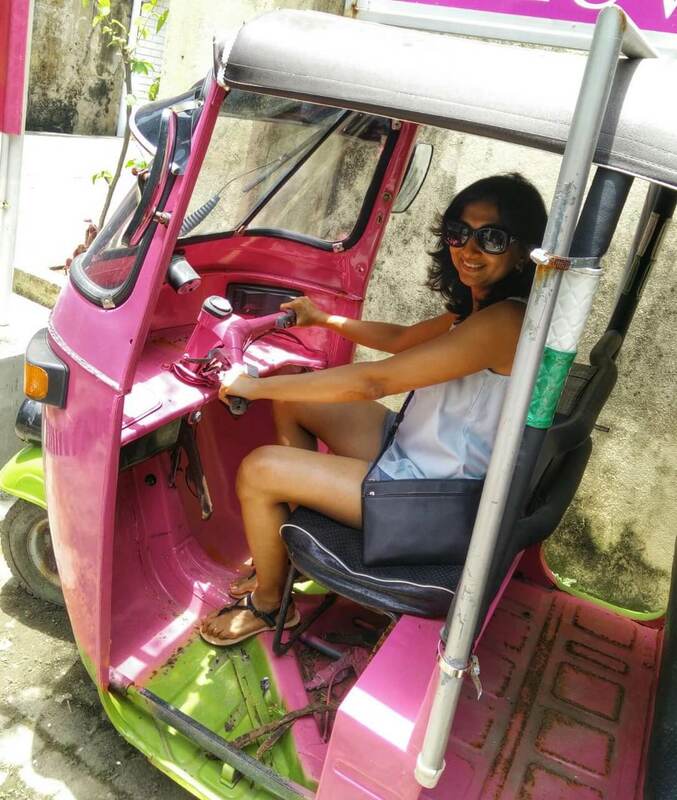 This was turning out to be a very unusual food walk, for we ate very little and walked more. As we finally began to feel a bit wary from all the walking, talking and clicking, Taykhoom took us to Taj Ice Creams in Bhendi Bazaar – a real gem of a place. 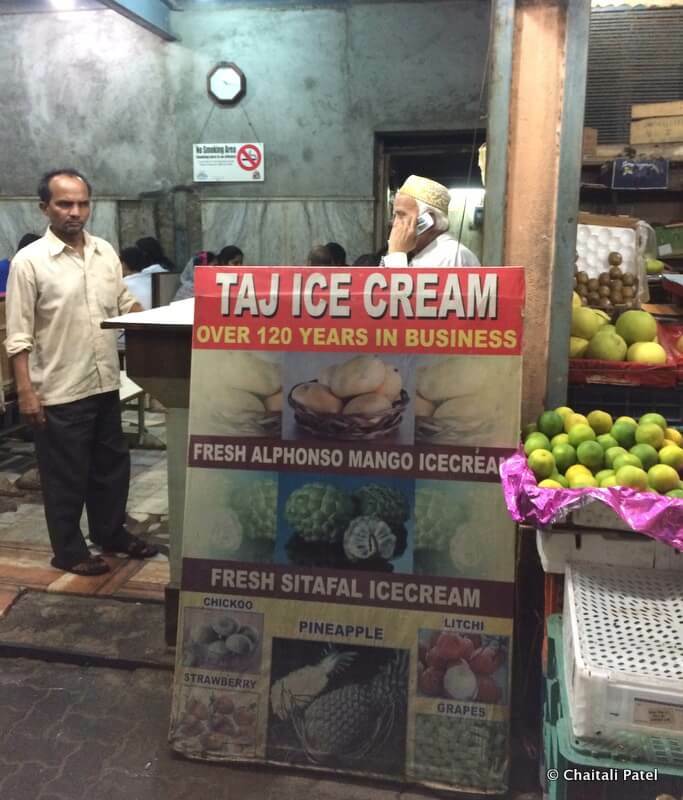 The 120 year old establishment serves hand churned ice creams made only from fresh ingredients. 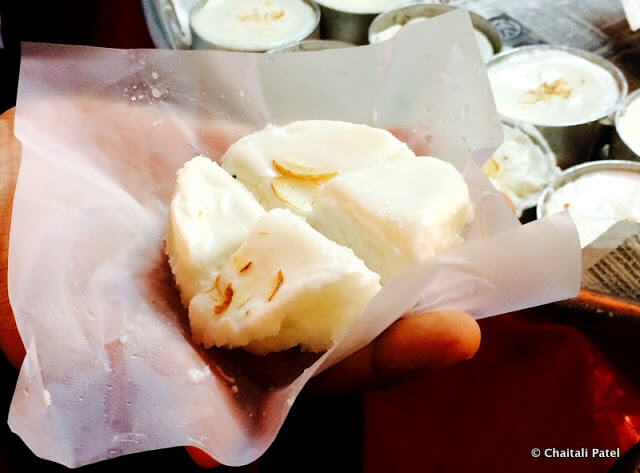 Close to a 100 kilos of ice cream is made everyday and some of the more popular flavors are mango, strawberry, chikoo (sapodilla), sitaphal (custard apple) and roasted almond. The creamy, flavorful ice creams were a fitting end to our long and exciting walk. 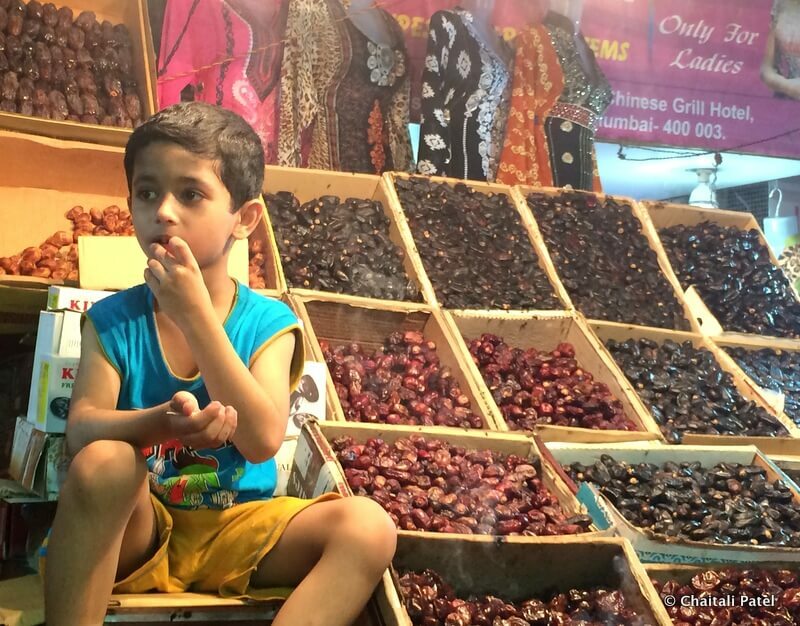 Have any of you been to Mohammad Ali Road during Ramadan or otherwise? What are your stories? All photos were shot on my iPhone 5S. Mobile phones come very handy when you need to be quick and less intrusive. 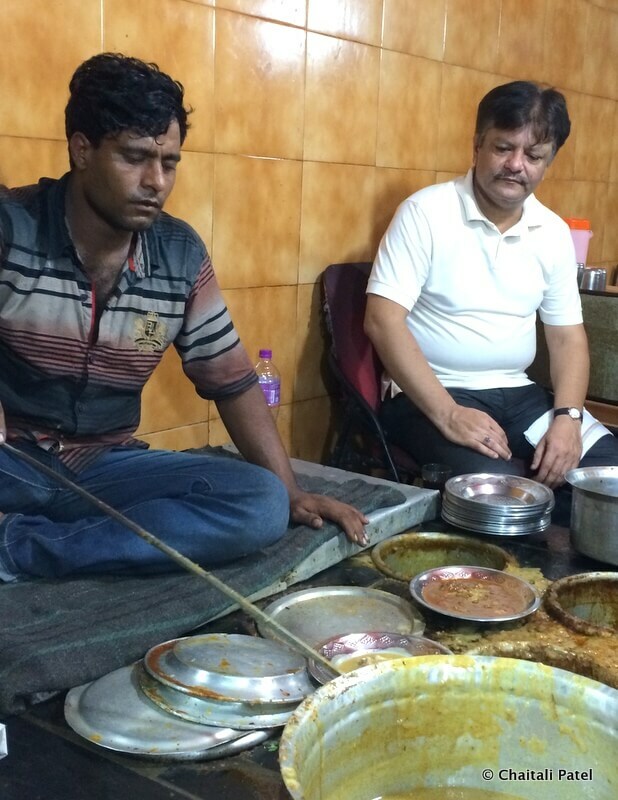 I am in the same boat, will not eat non-vegetarian and love to go to a place for the atmosphere. Thank you for showing me Mohamad Ali Road in Mumbai. 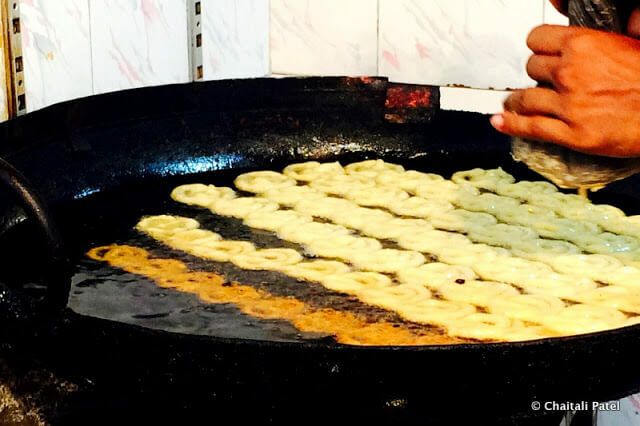 This is by far one of the the best post on Ramazan food in Mumbai i have read, the pics and the words everything is so engaging.. 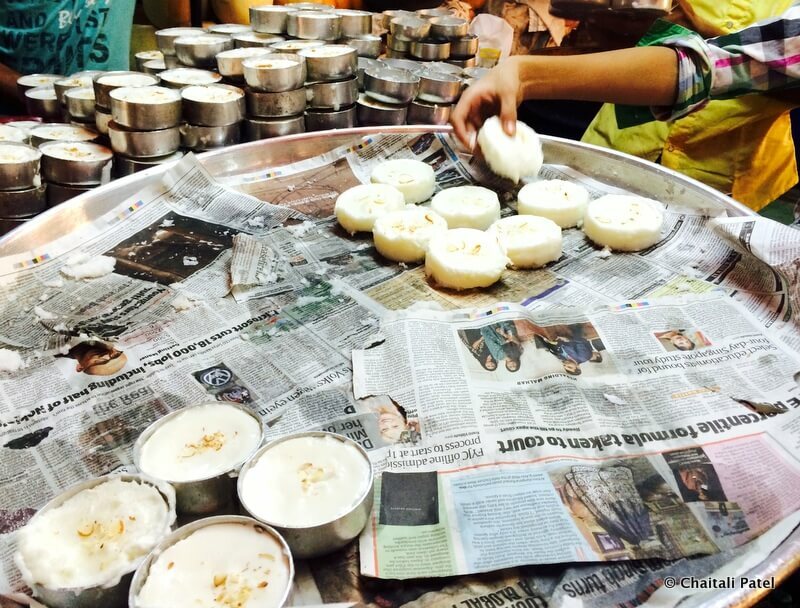 When I lived in Mumbai a friend who lived in Byculla brought Firni and other sweets for us. I need to visit Mohammad Ali Road during Ramazan next year…. Thanks Prasad, your comment made me very happy! 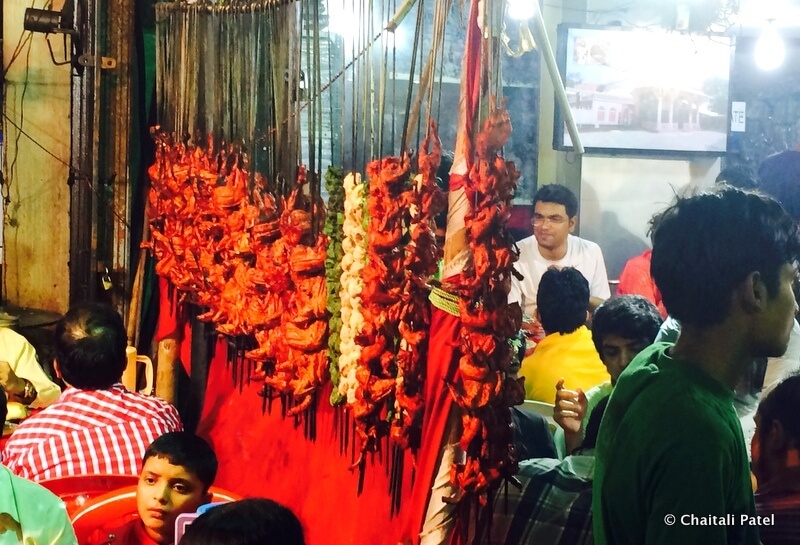 Glad you enjoyed the post and yes you must go to Mohammad Ali Road when you get s chance.